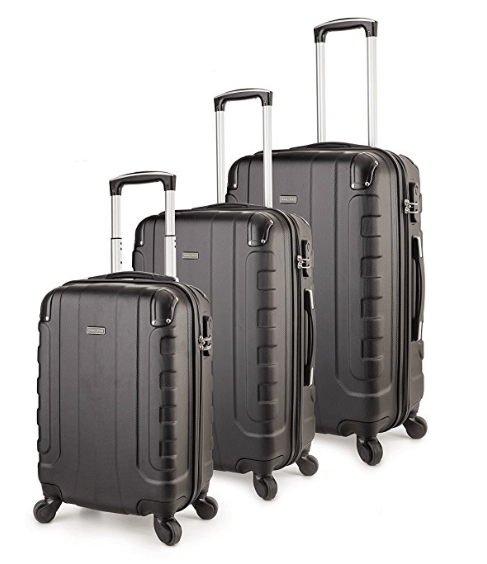 TravelCross Chicago is a solid luggage set of three light yet robust 20, 25 and 29.5-inch suitcases with 360-degree rotating spinner wheels. They offer reliability, functionality, and comfort with an ergonomic design and performance overall at a very reasonable price. It is a rather popular set as one of the better-selling luggage products on Amazon.com at the moment and scores 4.1 out of 5 by 40 customers. And you’re welcome to have a look through their reviews and ratings via the links on this product page. You have nine color options to choose from, with only the champagne color costing ten dollars more than the rest: Black, dark blue, orange, white, dark gray, red, silver and purple. You’re recommended to select “Conceal Package” when you check out as the packaging will be likely to show the contents. The bags are lockable with a combination code lock that was preset to 0-0-0 which you can change to any digits you’ll remember easily. And you can have a peace of mind but bear in mind that these are not TSA approved locks. The smallest carry-on bag weighs only 5.8 pounds and measures 18 x 14 x 8 inches without wheels. It is designed for use as a cabin bag according to IATA standards. And you can take it on the plane and fit in the overhead locker just above you. The medium piece weighs 7.45 pounds and measures 23 x 16 x 8.5 inches. 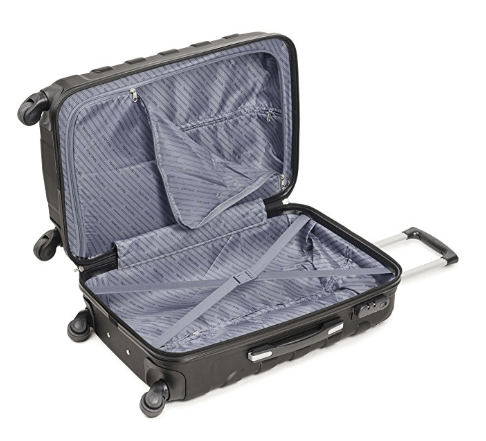 The largest suitcase has the weight of just over 9 pounds and the dimensions of 27.5 x 18.5 x 10 inches. You can nest each bag into one another, small into medium and the medium into large. These two shall need to be checked in at the airline counters prior to your flight. To have the dimensions with wheels please just add two inches to the height measurements: 20, 25 and 29.5 inches of height for the carry-on, medium and large. You can use each one or two of them for trips of different durations and they should hold well over time judging by the other TravelCross products. The four solid spinner wheels offer easy mobility and can be rolled smoothly and quietly. You’ll be holding it with the sturdy aluminum trolley handle with an ergonomic design to fit in your palm. Pulling the bags from behind is reported to work better than pushing it forward- more maneuverable from behind. All have the strengthened corners, several pockets, and comfy ergonomic handles. But the side and top comfy handles can be found on the medium and large suitcases but not on the smallest carry-on bag. It is a hardshell set that is made of solid yet lightweight premium ABS material that makes it resistant to impact and any rough treatment by the airline staff. Your clothes and other belongings will be protected well with the solid ABS plastic. Please note that these suitcases are rather spacious inside but not expandable which you may or may not want, depending on your storage needs. These are finely crafted and nice looking with a rather unique modern design, lightweight yet durable and reliable and functional bags at a great price. You’re getting pretty decent quality at a low price.